Prime Minister Manmohan Singh today categorically told the Lok Sabha that India was not willing to give any commitment on future nuclear tests. He also dismissed the concern raised by certain BJP members that the Indian separation plan was going to cost a whopping $ 40 billion. As many as 16 persons were killed and 35 were injured when their bus rolled into a 250-feet deep gorge in the border district of Rajouri today. Among the killed were three women and the driver of the bus, Baldev Raj. 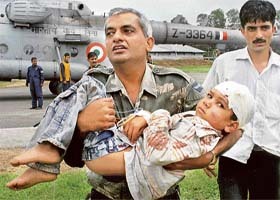 An Indian Air Force officer carries an injured boy to a hospital at the Air Force station in Jammu on Wednesday. A U S Northwest Airlines plane bound for Mumbai was turned back to Amsterdam's Schiphol airport today accompanied by Dutch F-16 fighter planes due to worrying passenger behaviour, officials said. Differing with the President of the Punjab Pradesh Congress Committee, Mr Shamsher Singh Dullo, with regard to forming an electoral alliance with Left parties in the coming Assembly elections, the Chief Minister, Capt Amarinder Singh, today categorically said he would not enter into any such tie-up with them in Punjab. The controversy over the new office-of-profit law that has been haunting the UPA Government from the very beginning refused to be resolved as the Supreme Court today took cognizance of a writ petition challenging the constitutional validity of the legislation and issued notice to the Centre. There is no scope for capping of our strategic programme. It will be decided by the people, government and Parliament of the country and not by any outside power. Over 10 Sikh youths were injured here today as the police cane charged members of various Sikh organisations, who were protesting against the cutting of hair of a Sikh boy in Rajasthan by some unscrupulous elements. 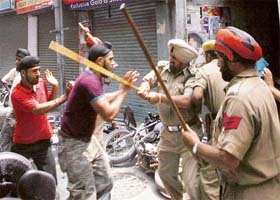 Policemen cane charge a group of Sikh youngsters, in Jalandhar on Wednesday. They were protesting against the hair-cutting incident in Rajasthan. The Punjab Chief Minister, Capt Amarinder Singh, today virtually cleared the way to appoint an Indian Police Services officer as a member or as the Chairman of the proposed State Vigilance Commission. Over a century-old puzzle of the Poincare Conjecture stands solved and the genius behind it - Russian mathematician Dr Grigori Perelman - wants no accolades, no awards and no recognition for this achievement, which has brought with it the prestigious Fields Medal, an analogue of the Nobel Prize in the field of Mathematics.